Kansasa City Fitness Training – Lose Weight and Feel Great at Hitch Fit like Melissa! WOW! Where do I begin? Melissa came to me with this quiet meekness, and wanted to do a Hitch Fit program. She was quiet, but definite. She knew what she wanted. I can’t tell you how much I have loved working with Melissa; watching her progress, seeing her overcome those blocks in herself, getting stronger in all ways. I have loved getting to know her; coaching her through the tough times, laughing with her, becoming friends. It has been such a fun and rewarding time! I am so proud of her. She is not only strong, Melissa is beautiful, inside and out. A True Gem. Please take a minute to read her story. “I thought a lot about starting Hitch Fit, before I ever came to Hitch Fit. I went back and forth in my mind of whether it was worth it or not. I had a couple of friends who were doing it at the time, and it sounded really interesting to me; something I would like to do. I decided to forgo signing up, and tried a cheaper route with a friend of a friend who was a bikini competitor. I was with her for six months before I decided to quit. At the point when I stopped working out with her, I had lost some inches, but I lost overall muscle and definition, too. Before that, I had been doing Insanity and Insanity: The Asylum, for about three years. After my first year of doing Insanity, I lost 30 lbs.. I was overall in pretty good shape, but wanted to step it up a notch. I also wanted help with my nutrition, which was the hardest part for me. I was tired of just being stuck where I was physically. I felt as if I wasn’t getting results anymore from any of the programs I had tried. Sure, these programs helped me maintain, for the most part, but I wanted to challenge myself. I wanted to push myself physically and see what I was capable of. After working with those trainers and programs, I was not only not where I wanted to be physically, but I was mentally not happy with myself. My self esteem was down, and I had very little confidence. So, what did I have to lose by joining Hitch Fit? Nothing! 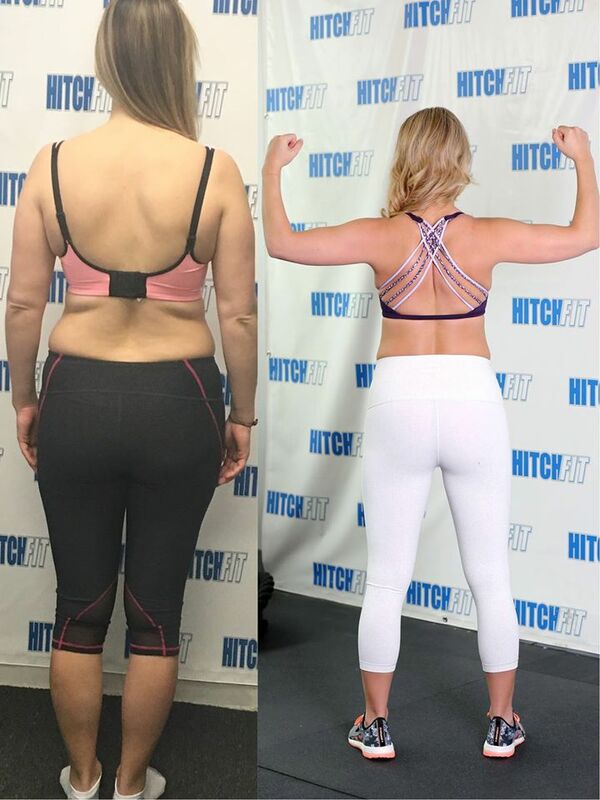 I finally decided to reach out to Hitch Fit and see where it would take me. Almost immediately I got a response, and Diana (Hitch Fit owner) told me that she believed Nancy would be the perfect trainer for me. And boy, was she right. The first time I met Nancy, we instantly clicked and became good friends. She was so positive and just radiated happiness. So, me being where I was, it was hard to not get a little bit of happiness rubbed off on me. She was one of those people that I just felt like I already knew. Needless to say, I felt safe and comfortable with her. That was something huge for me, as I was afraid to start the program. After day one, I knew this was going to be good. After awhile, I felt excited to go, and I enjoyed my time at Hitch Fit! I was excited about the program and to be a part of it, and to see where it would take me. Of course I had my hurdles to overcome throughout this program. Looking back now, a big hurdle for me was my mentality. I feel like I have grown so much in my confidence, and just general ability to love myself and my body. It seems so easy that you just need to follow the nutrition plan they give you, and the workout schedule. None of it was easy. The mental hurdle is saying NO to things you’ve always said yes to. I realized though, people notice when you have strength to say no, and they admire that. It’s almost rewarding in a way, and an assurance that you can do this, and that you’re doing the right thing. It was also hard to mentally prepare yourself to do workouts at 1am, (because that was literally the only time I could do it sometimes), just in order to get them done. Once you get over that hurdle, and get into the swing of things, there’s bound to be another hurdle. I can remember weighing in one day, not having the progress that I wanted, and I left crying. I ended up going to the gym and running so long and so hard, I got a friction rub on my arm. So, of course, I cried about that too!! At the end of that workout, I got home and realized my pants were inside out the whole time! You’ll have days like that sometimes. But I learned from it, prepared for the next weigh-in by evaluating how my body was responding to certain things, and changing it for the next time. All of these hurdles made me stronger mentally and physically, and ultimately put me where I wanted to be. Everyone at Hitch Fit, being a trainer or fellow trainees, was so positive and encouraging throughout the whole process. It made me feel so comfortable to work out in front of them, and pushed me harder to stay on track.